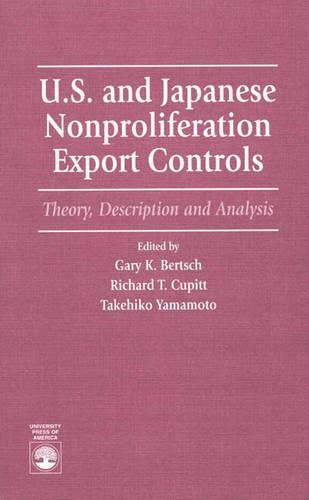 The editors of this book have gathered writings from various contributors who discuss American and Japanese views of nonproliferation export controls. Readers will see the U.S.'s perspective and the Japanese perspective on controlling the export of dual-use items for military security reasons and trading these items for economic benefits. The book provides an analysis of issues ranging from technology control to democratization to the different interests and preferences of policy-makers. It also examines the possibility of a multilateral export control arrangement through the cooperation of Japan and the U.S. This examination includes identifying policy implication, opportunities, risks and constraints that influence and create an agenda for future nonproliferation export control research between Japan and the U.S. This book will enlighten readers to the potential of a balanced and durable global partnership. The book will make a significant contribution to the on-going discussion on the development of export controls in the post-Cold War era. It will appeal to students and teachers of foreign policy, international relations, comparative foreign policy, comparative political economy and Japanese area studies. It will also interest the policy-making community.